Blogged updates from TradeMark G. and Assistant Frillypants of ECC research, discoveries, mischief, geekery, and noteworthy strangeness. If you're like me, you're constantly getting asked things like, "Why on earth did you paint that toaster purple and install it on the ceiling?" or "Why do you drive a hearse that looks like a zebra?" Of course, the answer is all too simple: I'm an artist. I'm taking license to make this weirdness. It's called Artistic License. But somehow it always felt like a hollow statement. After all, I didn't have an art degree, let alone a physical "artistic license", whatever that would be. But an answer was close at hand -- dang it, I'm an artist, a creator! When the world doesn't fit, I change the world! And so I created my very own Artistic License. I more or less yoinked the style of a Cali driver's license but added things like the medium of the artist, and I made a checklist of "Artistic and Behavior Codes" on the back. I also put an unexplained, mysterious "TYPE: X". Here's a zoom so you can see it all. I've been extremely happy with the results. Now when I show up at art openings, I just flash my ID -- I'm an artist! More free wine, please! 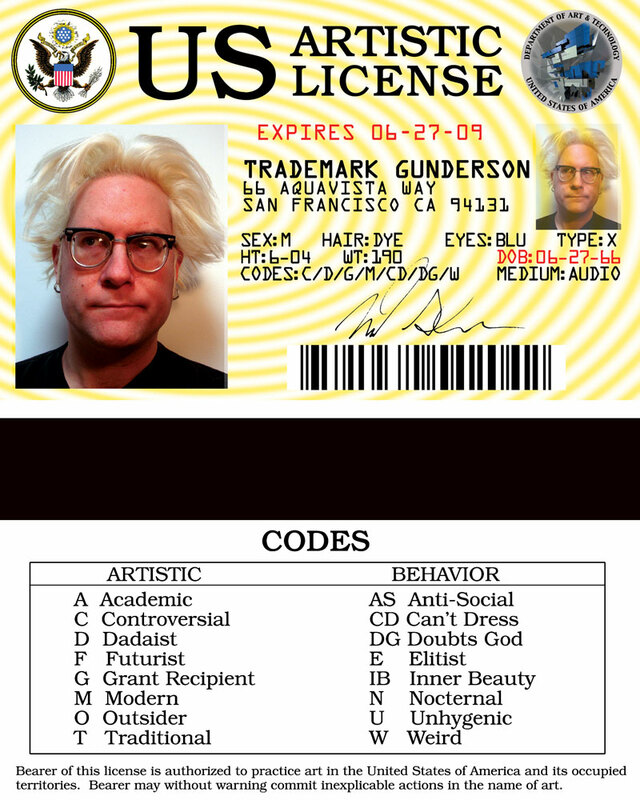 Even at clubs I present my license as my identification... because, by gum, I'm an artist, just the kind of artist who would be fully licensed. Although this is not legal identification in the government's eyes, I have presented it on many occasional to security personnel who want "valid ID". More times than not, they take it! So, it must be valid. Now YOU can carry ID to back that claim up. $20 buys you your very own US Artistic License with your photo and info on it. It is laminated and looks a wholelotta legal. Interested? Order one at this web page! And yes, for your information, I do have the authority to issue artistic licenses. Do you wanna see my license? I had a dream last night where we were meeting with Yoko Ono about getting separate vocal and instrumental tracks of Beatles songs for mash-up purposes. However, she was ambivalent about helping us because we weren't so interested in getting separates of her music. Ahhhh, the new website is starting to take shape... with the initial dose of content in place, it's time to try a post in this blog area. I'll likely be moving my blogging operations from LiveJournal and perhaps even closing an ancient, orphaned blog for my new home here. Then again, with blogs as part of Tribe, MySpace, etc. (all good ways to plug ECC shows); perhaps this will just shift the source of syndication here. It's embarrassing just how long the link-rotted old site has limped along. But finally, soon, it will get the retirement it should have gotten years ago.